Hello there everyone! Today for you I have a special mani in honor of a very important thing, and in honor of a very special someone! This month is actually Pancreatic Cancer awareness month and I just have to do nails for this because it has a special meaning. 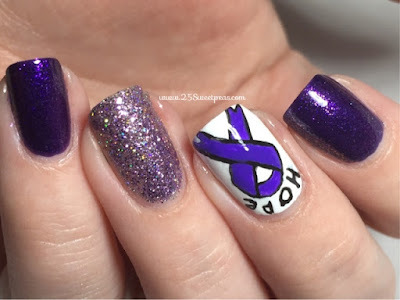 Last month there were so many causes getting attention and I will have to say I am pretty disappointed that Pancreatic Cancer isn't getting that attention even though this is its month. Pancreatic Cancer is a terrible thing and I wish they got that out there more so they could get more funding to do more to find a cure. I know they are working on it, I just really wish Pancreatic Cancer was acknowledged more, so since I can do something in support of it I am taking this chance to do so! :) Every little bit helps. 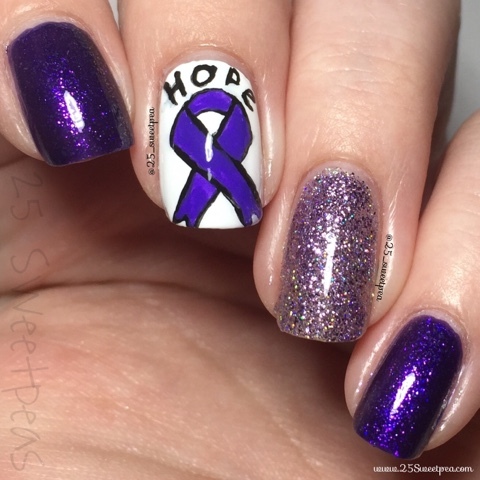 I did see people taking part in a Pancreatic Cancer Nail Art Challenge this month and I think that is wonderful! If I had known about it sooner I would of joined in. If you look under #Pcanovember2015 on Instagram you will see a whole bunch of manis in honor of Pancreatic Cancer Awareness! So amazing too see people coming together to support! I used Zoya Mimi on my index and pinkie. Then the white is Urban Outfitters Optic White. The glitter finger is a combo. 1 coat of Icing Sugar Coated, and then 2 coats of Essence Party Crasher. They look great together in my opinion. I almost forgot I had the Essence one but I am so glad I remembered. 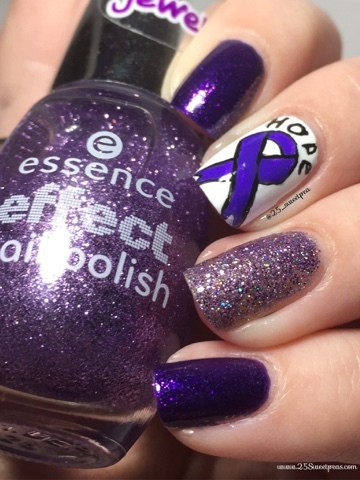 These nails are not the most fabulous by any means but doing a nails for a cause, and this cause in particular means a lot! The words and ribbon were completely freehanded, I used acrylic paint and my Espresso brush 20/0. Hope you al enjoyed these nails and overall I am just super happy I got to do them. 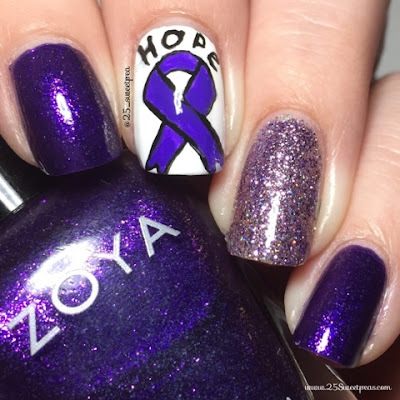 So much meaning and manis for a cause are wonderful.